Winter blew in slowly to my little corner of the Northeast, but now it seems it’s here to stay. And it’s cold. And the cold makes me want to stay home all day under my warm blanket with my trusty Kindle. But alas, life does not stop for the winter, so all of us cold-averse people will have to find a way to boost our energy supply instead. A couple of months ago I moved, and one of the perks of my new place is a wonderful little fruit store on the corner. For one, it’s open 24 hours a day, 7 days a week. But most importantly, it has great produce at great prices—most recently kiwis, which I hadn’t seen for a while. Kiwis, kiwis, kiwis. 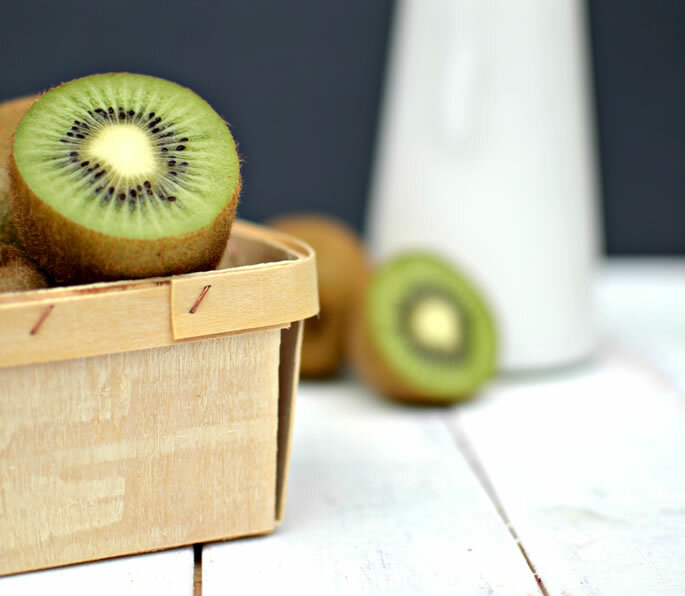 What to make with kiwis? Ice cream? A smoothie? Chutney? After a quick game of mental ping-pong, the smoothie won out, and I started thinking about what to pair it with. I know kiwi-strawberry is a common favorite, but I once mixed strawberries with a different green fruit, and the color was positively awful. So I decided to stick with green and other neutral colors: kiwi, honeydew, spinach and banana. 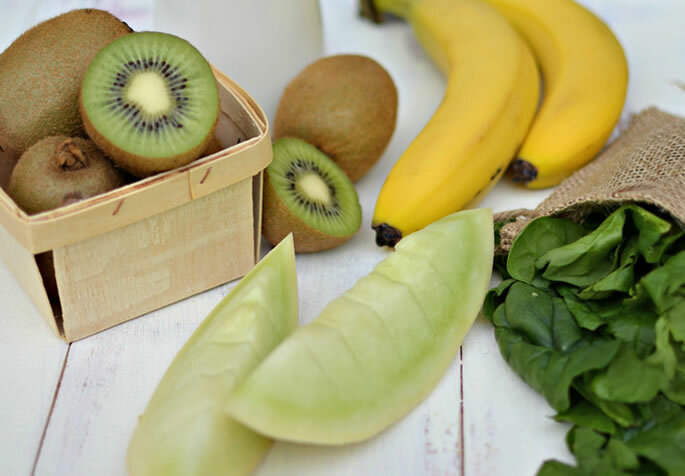 Now, there are several ways to make smoothies, and if you’re a regular smoothie-maker, no doubt you’ll have your own method down pat. But for the uninitiated, here’s how I do it. Cut the fruit into pieces, and freeze on a flat surface. If you’re going to be storing some of the fruit for later, still freeze it on a baking sheet, and transfer it to an airtight container only once it’s fully frozen. This prevents “frozen fruit rage,” when two weeks down the line you find yourself bashing a solid block of icy fruit with a hammer to get the handful of pieces you actually need . . .
Now, pick a banana. I like to use the brownest, mushiest banana I can find. Sounds a little icky, but those are the sweetest, and I find the flavor gets mellowed by the coldness of the smoothie and the other ingredients. Decide which type of milk you’ll use. I usually use almond milk, but you can use cow milk, soy milk or any other milk alternative. Want to boost the nutrition level of this drink even further? 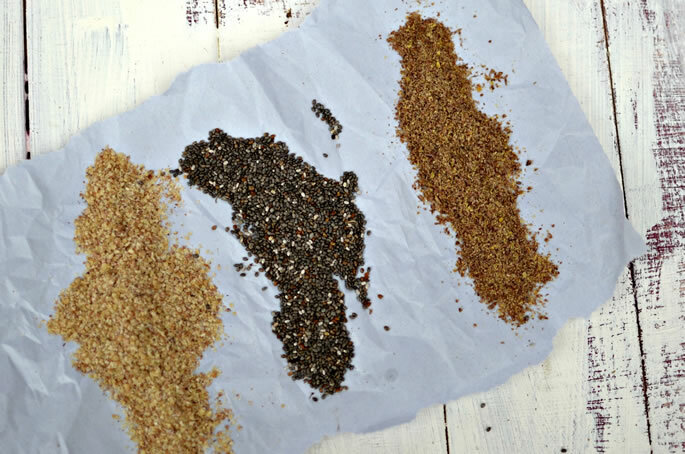 Add some seeds—I like chia, flax and wheat germ. Add one, two or all three. Skip the seeds entirely if they scare you; it’s still a super smoothie! Time to put it all together. Take out your blender. Throw in all the ingredients and blend until smooth. Add some ice for a thicker drink. Pour into a tall glass and enjoy. 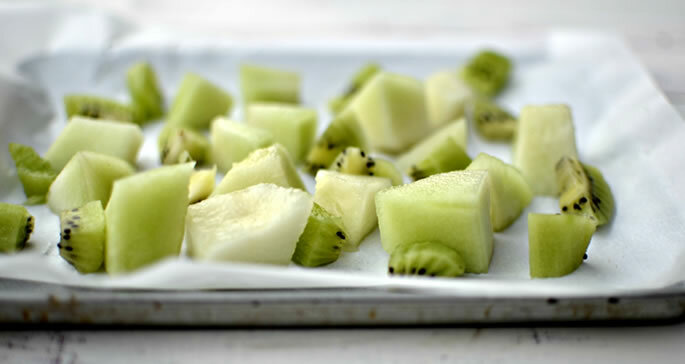 Cut the melon and kiwi into small pieces, and freeze. 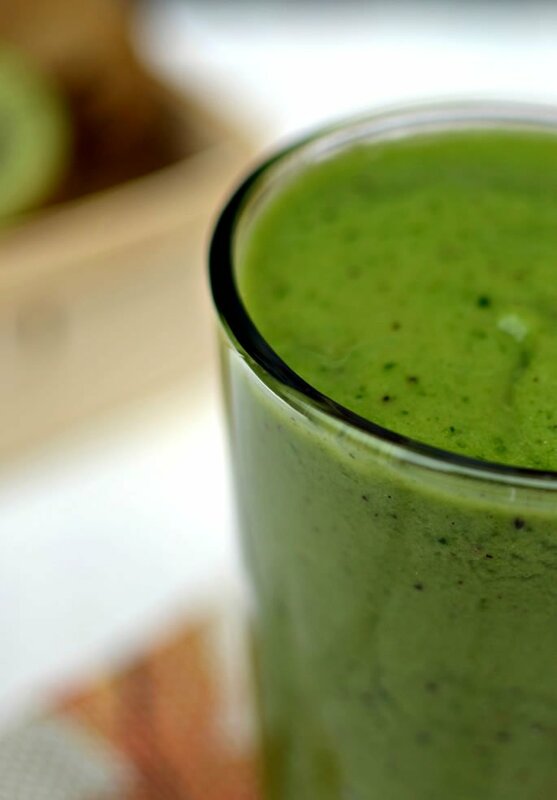 Blend the frozen fruit, banana, spinach, milk and seeds. Made extra? 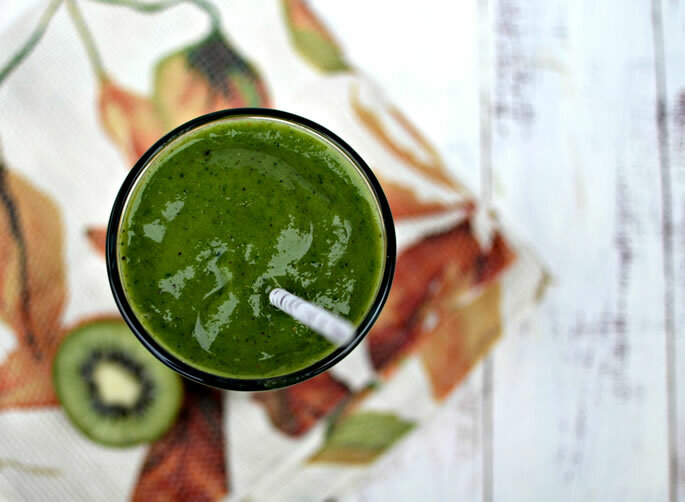 Got picky kids who won’t try a green smoothie? Try freezing some into ices! If you live in the Southern Hemisphere and are roasting away under the hot summer sun, this recipe is for you too. 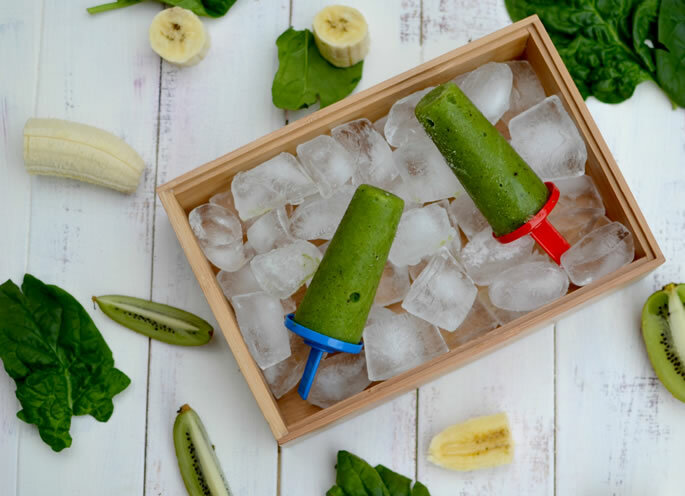 A cold, sweet, nutrient-dense, sugar-free treat, what could be better? If you’re shivering just at the thought of an ice-cold smoothie, stay tuned for a much warmer winter recipe next week. Thanks! Thank you everyone for the lovely feedback. I'm so glad so many of you are going to try it! really nice recipe! i wanted to start juicing what an encouraging delicious start.